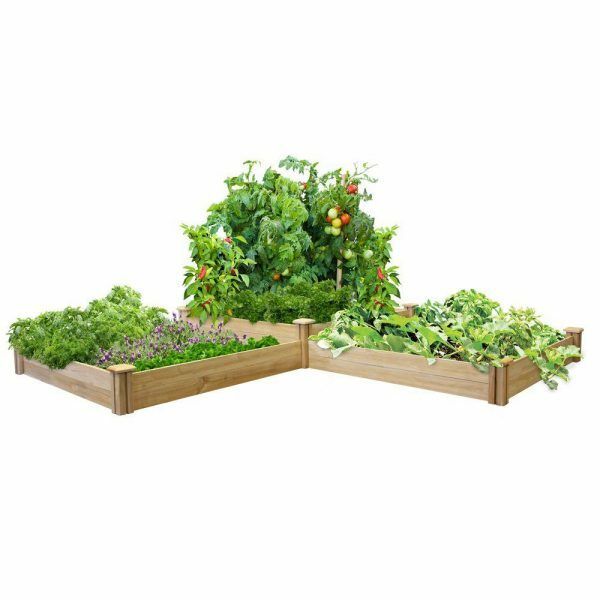 Definitely mind- blowing raised garden bed kits available on the market are ready to be easily assembled right out of the box! They are so attractive and easy to assemble that everyone loves them. Not to mention the fact that you can find so many different types and models and they can fit into any environment. Price range is from $50 to more than $500 , but it’s all up to you to choose the one you like most and best serves your needs. We are glad to outline the key benefits of all the selected models so that it would much easier for you to choose one from this truly stunning collection. Enjoy some unique design solutions, consider their functionality, durability, and options for upgrading, and make your choice! This is a great two-tier planter!! Overall, it is very easy to put it together. Definitely looks great positioned in any space! Made of 100% western red cedar. Bonus storage shelf provides ample space for small tools and garden supplies. It has no pilot holes for screws so you can put it as high or low as you need. The downside is, unless you have something level to prop it on while screwing, it is no longer a one-person operation. Also, do not move the planter without attaching the bottom shelf. The parts of the main box that are not screwed to the legs are stapled in and will pull out easily. A stylish, durable, low-maintenance, sturdy, easy-to-install raised garden bed option of high quality. 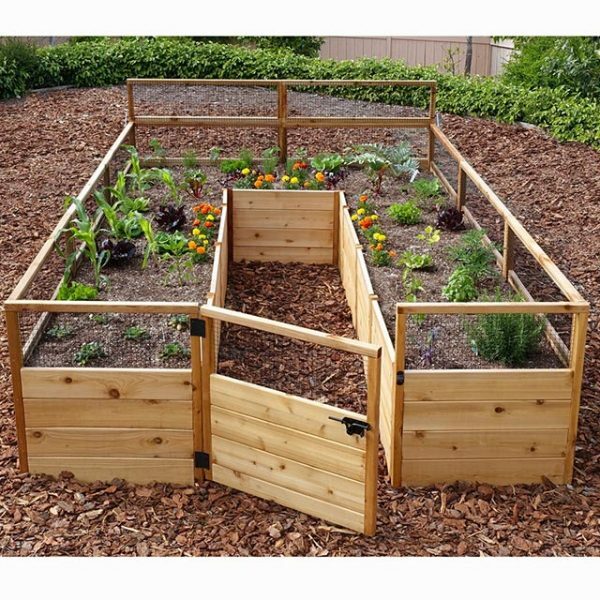 Perfect to use grow your perfect vegetable garden. Constructed of UV-protected polyethylene, which will not rot, crack, or peel. Absorbs and retains the warmth needed for the root development. 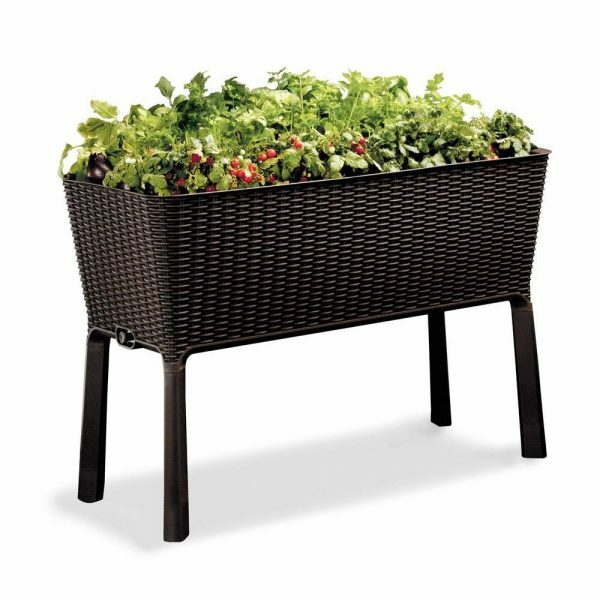 This nice-looking, easy-to-clean, weather-resistant unit is definitely a stylish way to grow your own vegetables, herbs, or flowers. Plus, the early start enclosure made of clear vinyl is a great bonus feature. Actually, this model is 8 pieces, making two 4 ft. x 4 ft. boxes and comes in brown. This means that you can the 2 beds vertically to create a deeper bed for growing deep-root vegetables, such as potatoes. Made from 100% chemical free rot- and insect-resistant cedar. Product dimensions 49 x 12 x 8 inches, item weight 56 pounds. An attractive, easy-to-assemble product with a great shape that can be configured to fit your needs. An awesome option for creating a garden in a hurry and on a budget. This raised bed unit blends in perfectly with any garden and landscaping, it doesn’t look out of place at all. Nothing extraordinary, just a convenient product to start a raised garden if you don’t have the tools or time to construct your own one. Note that wood is not the highest quality and the side boards are rough and splintered. 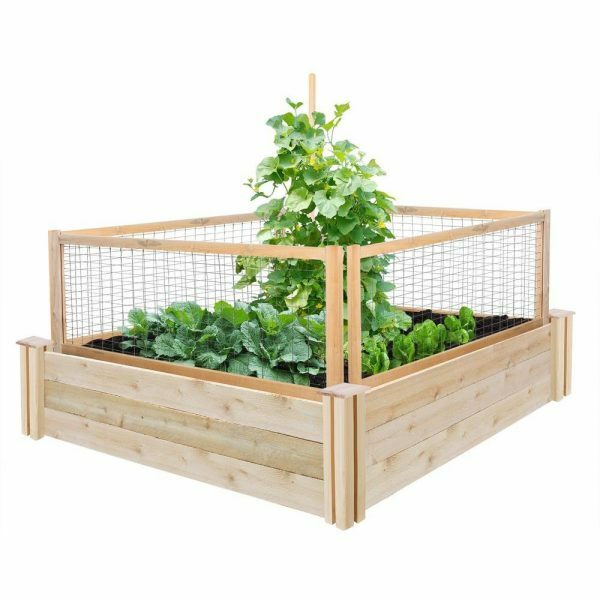 As it is made from natural rot- and insect-resistant North American cedar, this kit is perfect for organic gardens! Product dimensions 48 x 21 x 48 inches, item weight 40.5 pounds, the unit uses 1 cubic yard of soil. Extremely easy to put together, no tools needed. Plus, it looks much better than plastic containers. Definitely this is a great option for beginners. These three tiers are great for planting different types of plants that need different lengths for root growth. Plus, the three levels could be used separately. Note that the wood is not of high quality and the pieces are not duly labeled. Consider using cedar garden bed oil to protect the this raised bed against weather and drying and enhance its look. Instant fabric raised garden bed option of great depth so the plants can get good healthy roots. 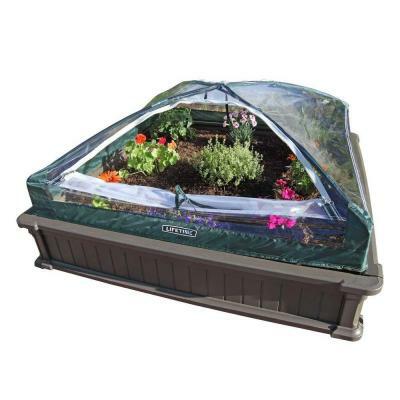 Easy to use, no assembly required, all you have to do is fill it with soils and either plants or seeds. An awesome alternative to wooden gardening boxes. Made of a highly durable, UV resistant, non-woven fabric. Allows air flow throughout the soil and excess moisture easily drain away. Different sizes are available to choose from. 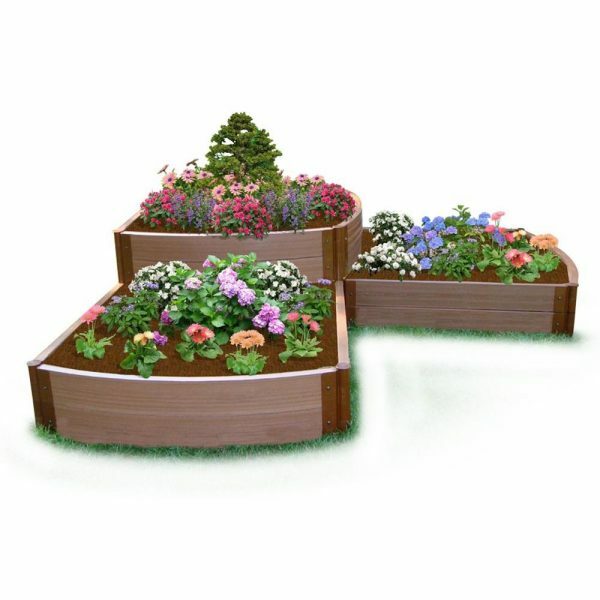 This raised garden bed can be placed on any flat surface. With the product, you can have a garden virtually anywhere! Definitely seems to be the perfect raised bed option. It could be a little more attractive, though. Product dimensions 48.8 x 9 x 48.8 inches, item weight 42.5 pounds. 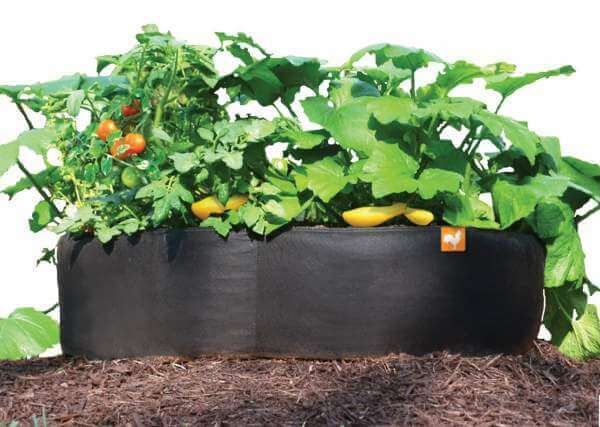 Constructed of UV-protected high-density polyethylene, this raised bed will not rot, crack, or peel. A sturdy, easily-to-assembles option, no tools needed. Durable, low-maintenance, and weather-resistant design, which absorbs and retains the needed warmth for the root development. Plus, if you grow deep rooted plants, you can stack one bed over another to create a bed with 18″ high walls. 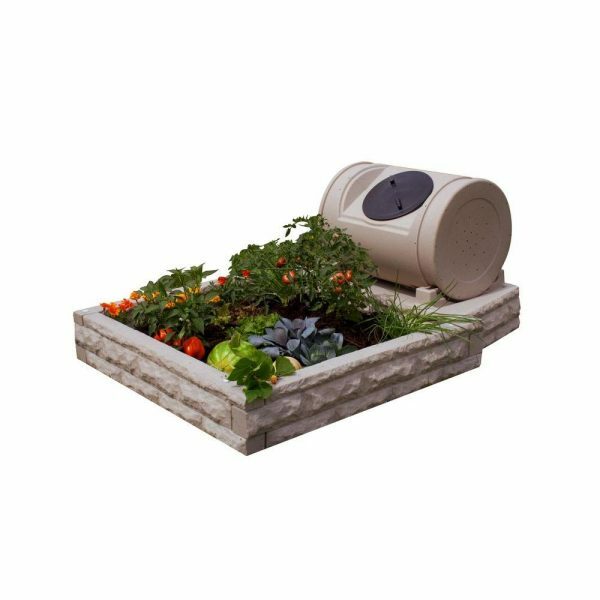 This garden bed kit comes in a neutral color and blends well with the yard. Definitely an excellent raised garden solution! Note that the product comes with only picture instructions. Product dimensions 42 x 42 x 8 inches. Made from recycled materials, an easy-to-clean and easy-to-assemble option, no tools required. 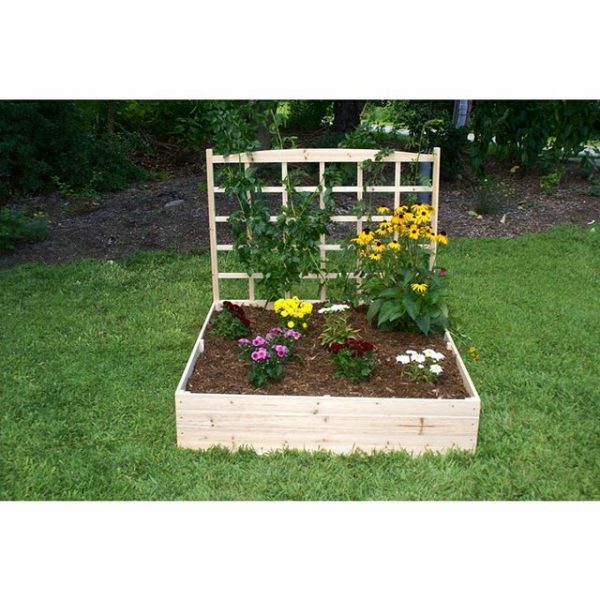 A single raised bed of square shape, which can be used to plant herbs, vegetables, or flowers. Functional, sturdy, durable, stylish, of high quality, versatile, looks more expensive than it really is. If you need an attractive solution to fit in any yard and transform a bare, unused space into an instant garden, this raised garden bed is definitely the perfect choice! The bed can be used even as a sandbox. Note that the edges are very rough. Made from durable, UV-protected resin. Easy set-up, easy to move if needed. Will not rot and decompose like the wooden versions. Gorgeous raised garden bed in a vibrant color. The self-contained watering system automatically waters plants, drainage holes to prevent over-watering. Aeration screen helps provide the proper amount of air to plant roots. Mulch cover helps eliminate weeds and conserve water. An excellent product that turns a patio or any other small area into a personal garden! Definitely a stunning option to add functionality and visual interest to your living space! Note that the bed needs a specific potting mix. Also, the system that secures the black plastic cover to the base is not working properly. Product dimensions 48 x 48 x 10.5 inches. Definitely a solution, which adds visual appeal and interest to any garden. This made of cedar and galvanized steel raised bed option of a square shape assembles easily. CritterGuard fence panels, which are 23.5 in tall x 45 in long, come assembled in the package. You need 15 cu. ft. of soil to fill this raised garden bed. The unit is the perfect solution to guard against all types of critters. You won’t find an easier way to create the garden of your dreams. An innovative animal-barrier option, which has yet to prove its functionality and usefulness. Looking for a solution to dramatically improve your outdoors? 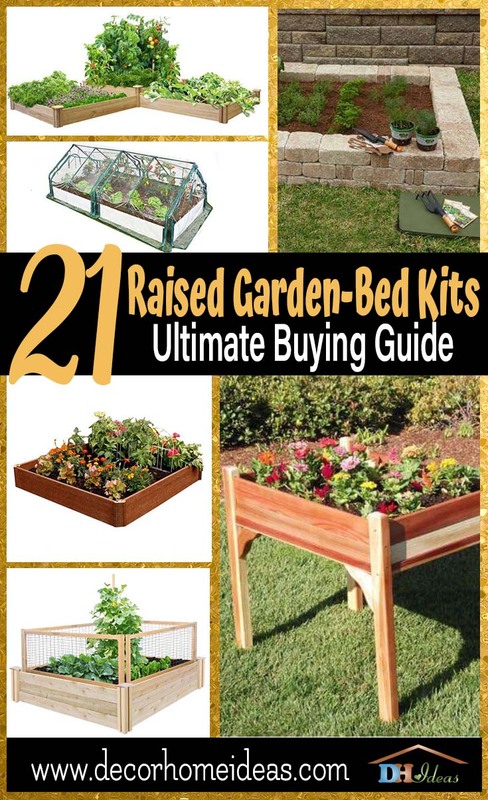 Give this raised garden bed a try! A durable, attractive option, which allows adding texture, charm, and personality to any exterior space. Product dimensions 70 x 10.5 inches. An easy-to-assemble concrete raised garden bed of a rectangular shape. The kit includes large, medium and mini stones, no cutting required. 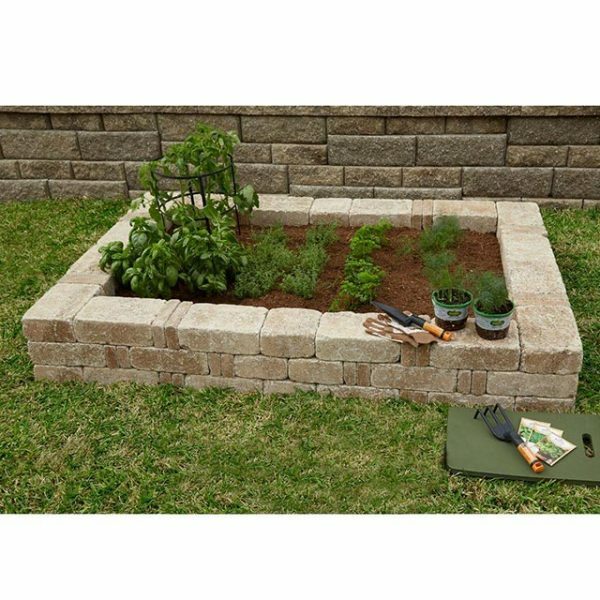 This raised garden bed is available in three colors to choose from: cafe, sierra blend, and gray stone. An easy DIY project with a spectacular result! This option offers an easy way to both add to the functionality and enhance the look of your outdoor living space. Product dimensions 36 x 24 x 32 inches. An easy-to-assemble rectangle wood raised garden bed made from 100% redwood. Natural weather-resistant design. 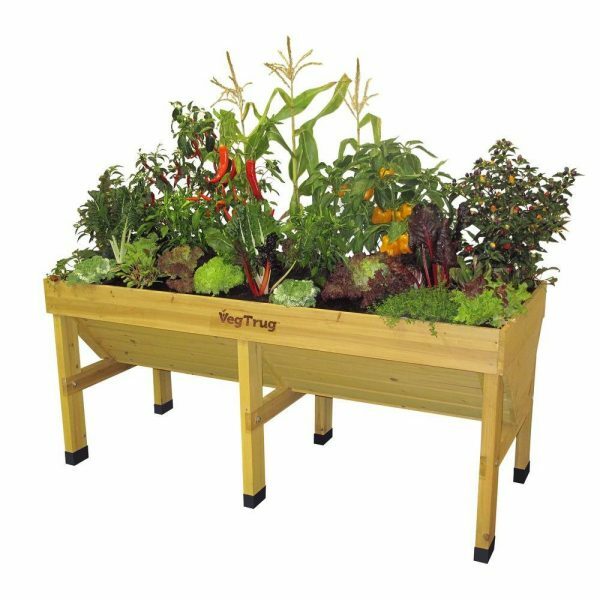 Functional, durable, stylish, inexpensive, of a perfect height for easy gardening. 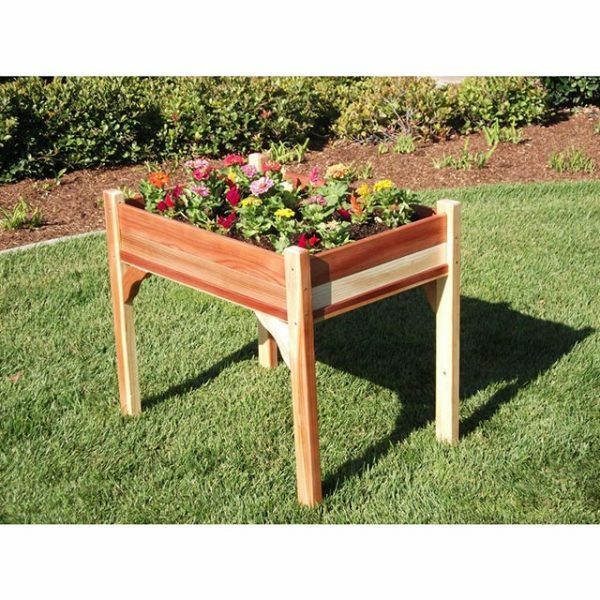 This redwood raised garden bed is an appealing movable solution to your gardening needs. 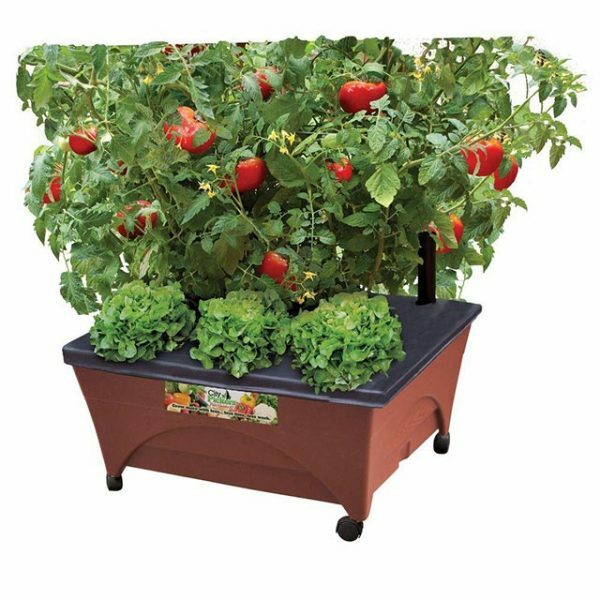 An ideal option for decks, apartments, small patios, or anywhere you would like to grow vegetables, herbs, or flowers. 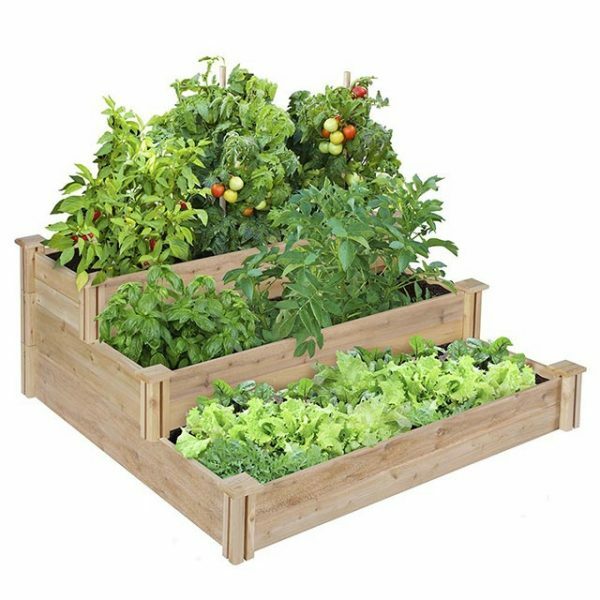 This raised garden bed is a stunning way to both make your gardening experience easy and enjoyable and add visual interest to your living space. Note that the wood is rough, there are some splinters. Also, better assembly instructions are definitely needed. Product dimensions 4 ft. x 8 ft. x 8 in. An eco-friendly gardening option with composite boards made from recycled plastic /38%/ and sustainable hardwood fibers /62%/. With its crisp, white timbers, this raised garden bed can lend an adorable, traditional look to any exterior or interior space. 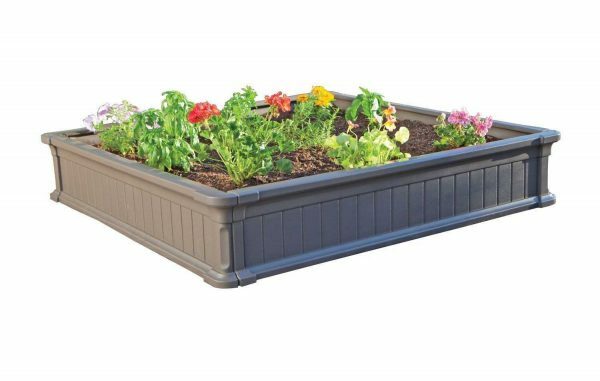 This raised bed of a rectangular shape with a scratch-resistant finish is a low-maintenance solution, which offers versatility and better conditions for growing any kind of plants. The unit offers 64 sq. ft. of planting area plus 48 additional sq. ft. of vertical planting, which allows growing more in a smaller space. Definitely a solution that can raise your gardening experience to new heights. This attractive, innovative gardening option has yet to prove its functionality and usefulness. Product dimensions 4 ft. x 8 ft. x 8 in. 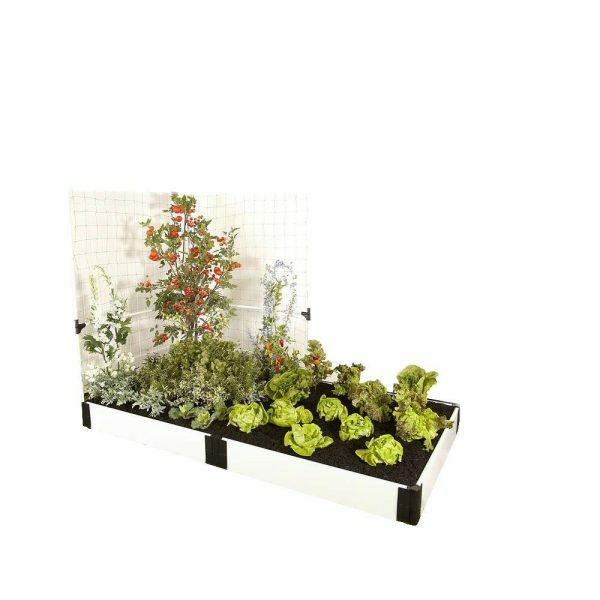 An eco-friendly modular garden kit with an attractive, traditional look and 32 sq. ft. of available planting area. Functional, durable, stylish, made from recycled plastic and natural fibers, with a scratch-resistant finish. Zippered windows provide easy access and control over humidity and temperature. This is an option, which can be positioned on both soft-surface landscapes and hard surfaces, such as rooftops, patios, and decks. Two greenhouses offer a friendly environment for growing different crops. Solid, durable, built from high-quality sustainable fir, easy to assemble, useful how-to-build instructions, attractive, comes with plastic feet to protect legs. Holds 380 qt. of soil or compost. This elevated garden bed is with the perfect working height, requires no bending or digging, an ideal option for most wheelchair users. In order to extend your growing season and experience, you can use an array of available accessories to upgrade this gardening option. This product is definitely a stunning way to add to the functionality of your living space. Furthermore, it brings it charm, personality, and visual appeal and interest. Give it a try! A raised garden bed option of ultra-fast and easy assembly. The most innovative patent pending raised bed available on the market. Plastic, of a rectangular shape, the first ever self-watering raised garden bed with a composter. Four 50 in. wall sections interlock to enclose a 4 ft. x 4 ft. x 10 in. space with a unique self-watering system! This means that your plants will be always watered and never overwatered. This raised garden bed definitely goes far beyond pure functionality. It is a statement piece of décor, which can enhance the look of any outdoor space and add tons of charm, visual interest, and personality. Are you ready to try it? Raised garden bed with a low-maintenance, eco-friendly construction with composite boards made from recycled plastic and sustainable hardwood fibers. A durable, visually interesting, multi-level design solution, which offers an array of planting options. 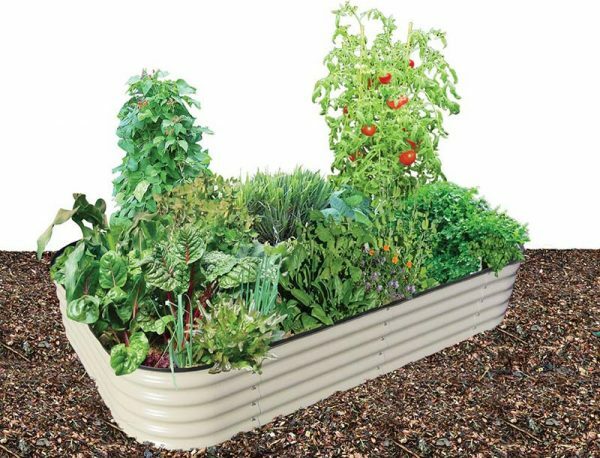 As with all modular systems, you can upgrade and reconfigure this garden bed with existing and additional components to serve your needs for growing different plants. 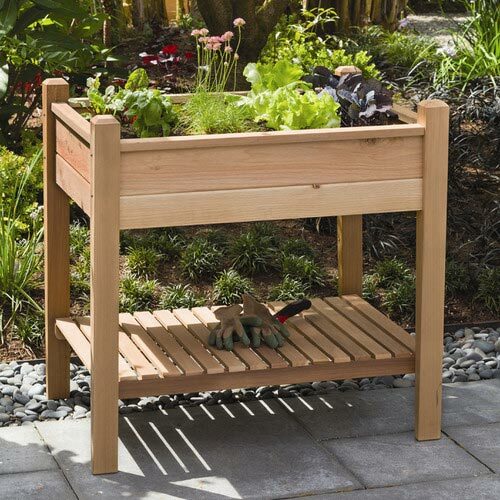 This split raised bed is an attractive garden item. When filled with blooming flowers, it definitely turns into an enchanting piece of décor, which grabs and keeps attention. Note that the kit comes practically without assembly directions and you have to plan this configuration yourself or come up with another one with all the pieces. 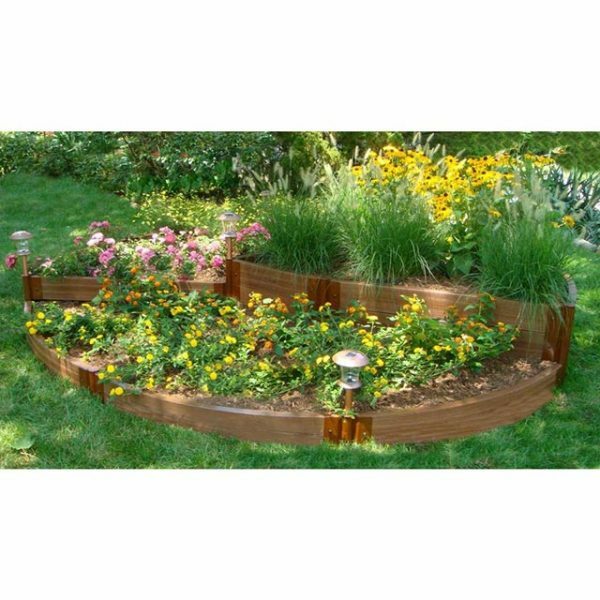 An eco-friendly, low-maintenance, multi-tiered raised garden bed of compact design and a circular shape with composite boards made from recycled plastic and sustainable hardwood fibers. The layered style of this garden bed definitely resembles traditional English gardens. Being a unit of a Frame It All Modular System, this option can be upgraded and reconfigured with existing and additional components and accessories to suit your gardening needs. 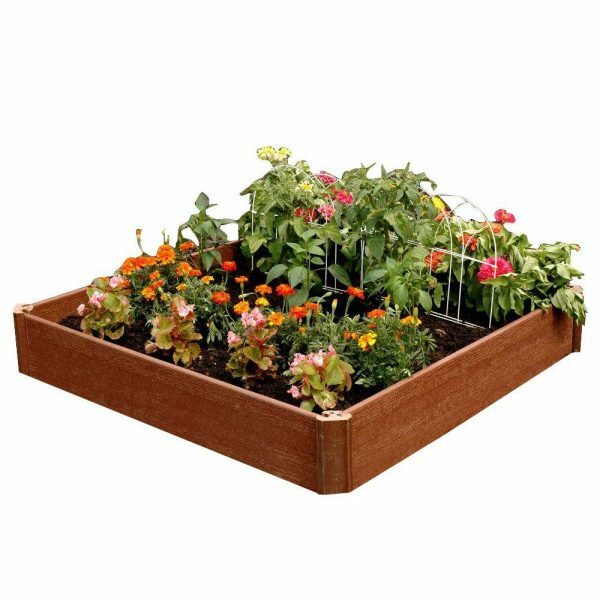 Made of solid, rot-resistant fir wood, of a square shape, this sturdy bio-degradable raised garden bed of unique design is a gorgeous addition to any space. An easy-to-assemble option, no tools required. Reinforced panels prevent warping over time. As it is made of fir wood, it can be painted to blend in with the décor. Adding a trellis to this garden bed not only increases growing space but also provides a better access to sunlight. Not to mention that apart from functionality, the trellis adds visual interest and personality and turns the unit into a statement piece of décor. Consider protecting it with a clear coat of polyurethane. Stylish, functional, durable, easy-to-install, easy-to-clean, fade-resistant, of high quality, ample growing capacity . Constructed from polypropylene resin, it can stand up to the elements, which makes this elevated garden bed suitable for both indoor and outdoor use. The bottom watering feature creates healthy plants. The wicker look of this planter is much classier than a plain, wooden planter and turns the unit in neutral color into an eye-grabbing addition to any space. Note that once it’s filled with soil, the bed is not really moveable. So make sure you have it where you need it. Product dimensions 28.2 x 16 x 7.1 inches. Super easy to put together raised bed option. 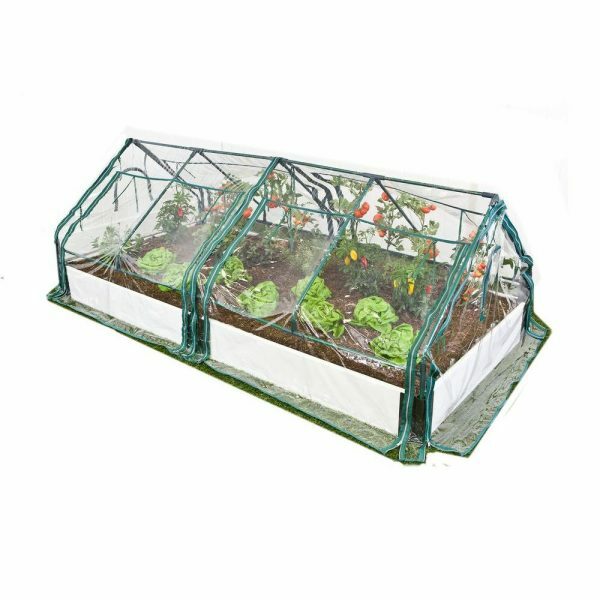 Suitable for growing vegetables, herbs, and flowers. Deep enough to grow root vegetables. Made from extremely durable steel with Colorbond coating. The kit comes with a plastic protective edging for the top edge. As for assembling, the kit allows to choosing from four shapes. Opt for this one, which best serves your gardening needs. Furthermore, you can buy more kits and arrange in multiples to create an attractive and functional garden spot. Note that assembly is definitely required to screw the pieces together in the configuration you want. A raised garden bed made of western red cedar, water- ,insect- ,rust-, and rot-resistant option of rectangular shape. A door with an eye-grabbing latch not only makes this bed easily accessible from all sides but also adds visual interest and definitely turns this design into a statement garden piece! In addition, a folding trellis can be mounted either on the sides or the rear of the bed for a total height of 47″. This will give your climbing plants or vegetables lots of space to grow! An attached wire mesh screened frame increases the height and helps keep away garden and yard pests. Note that although this garden bed is an easy-to-set-up option, however, assembly requires a number of tools.